LeafLock Gutter Guards - The Best Gutter Guards Available! There many different types gutter guards, gutter covers and gutter protection – they all aim to fix the problem of clogged gutters. A quality gutter guard system should keep your gutters clean , allowing the water to flow freely down your gutters. Having gutter guards will ensure your guttering system protects your house by channeling water away from your home and foundation. CAUTION: Not all gutter guard systems are the same. Why Bruce Andrews Seamless Gutters LLC is the Best Solution for you gutter guards. We only use the LeafLock™ Gutter Guards. Leaflock™ has taken the best existing and best selling preferred “nose forward” design, made it thicker, coated it with the best finish known in the home improvement industry, and combined it with the strongest self-supporting bracketing system the gutter guard world has ever seen. They have engineered it to work with the best seamless gutter installation system, LeafLock™ Gutters Installation. Clogged gutters prevent the water from freely flowing through your gutter system. Only one inch of rain is equivalent to 500 gallons of water. Think about that much water quickly falling directly onto your homes foundation. This amount of water over time can wash away soil around your foundation and damage landscaping around your home. LeafLock™ Gutter Guards permanently solve this issue by ensuring that leaves, pine needles, and other debris to not make into your gutters. They truly are the worry free solution to clogged gutters. Can’t I just clean my gutters every year? Cleaning clogged gutters unnecessarily consumes time that could be better spent. To effectively keep your gutters clean, they must be cleaned whenever something obstructs the water flow. This could keep you on the roof far more often than is desirable. The best option is to fix the problem before the problem exists! More than 90,000 people receive emergency room treatment from ladder-related injuries every year. Why take the chance when you don’t need to? 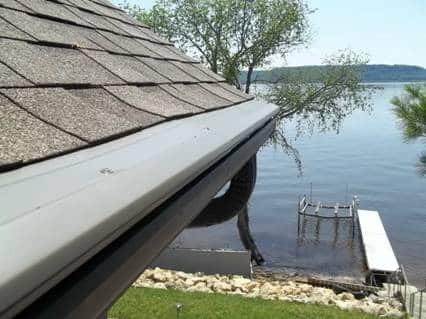 Contact Bruce Andrews Seamless Gutters LLC today and let us show you how gutter guards can help your home. Please call 1-877-594-7449 or click here to contact us about your gutter guard job.